Students at Cooper Union for the Advancement of Science and Art are protesting a new tuition plan. Editor's note: This story was updated May 16, 2013, to reflect new information about the student protest. 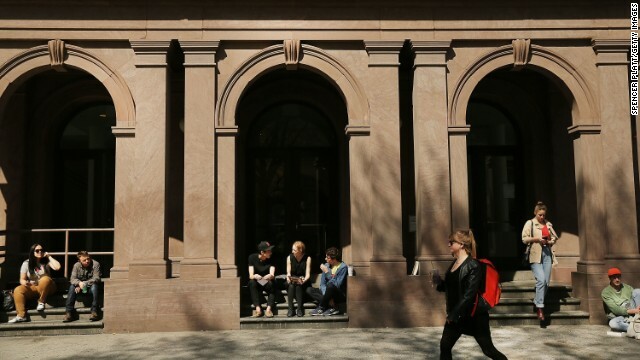 (CNN) - For more than a century, Cooper Union for the Advancement of Science and Art in New York provided free education to all admitted students. But the school isn’t immune to the money crunch forcing tuition increases at colleges across the country. In April, Cooper Union announced that it will start charging tuition for undergraduate students matriculating in fall 2014. Citing a $12 million annual budget deficit, the Cooper Union Board of Trustees will scale back the full scholarship it has traditionally awarded. Students believe the administration’s decision casts a shadow on future students’ education. At least 50 of Cooper Union's nearly 1,000 students have been occupying President Jamshed Bharucha's office on the seventh floor of the school's Foundation Building. The students organized a sit-in to protest the decision to charge future undergraduate students half the cost of tuition, up to $19,000 a year. This week, they painted the office’s lobby black as a symbol of their protest. Cooper Union junior Troy Kreiner said it was an extension of a demonstration by architecture students, who painted another lobby black to protest tuition. “Painting the lobby is a nonviolent action that visually transforms a space by the students. It is also a way to mobilize students in direct action through communal effort,” Kreiner said. Bharucha met with the students, who have occupied his office for more than a week, although no resolution has been reached, according to Claire McCarthy, Cooper Union's director of public affairs. Many borrowers are making financial sacrifices due to growing amounts of student loan debt. New York (CNNMoney) - Student loan debt is leading some borrowers to put off buying a home, saving for retirement or even getting hitched - and many now regret taking out the loans in the first place. About three-quarters of student loan borrowers surveyed said they - or their children - have been forced to make sacrifices in order to keep up with student loan payments, according to a survey from the American Institute of CPAs.Forty-one percent of the more than 200 people surveyed said they have delayed saving for retirement, 40% have put off buying cars, while 29% have postponed home purchases. Even marriage has been put on hold, with 15% of respondents saying they delayed tying the knot because of student loan debt. The majority of borrowers said they didn't anticipate having such a difficult time repaying their loans, and 60% feel some amount of regret about the decision to fund their education this way. 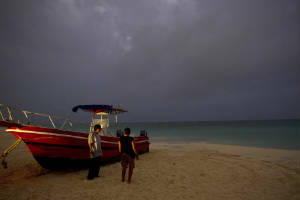 "[Graduates in debt] start out with an anchor that slows their progression toward future goals," Ernie Almonte, chair of the AICPA's National CPA Financial Literacy Commission, said in a statement. More than 4 out of 10 recent graduates say they are stuck in jobs that don't required a college degree. 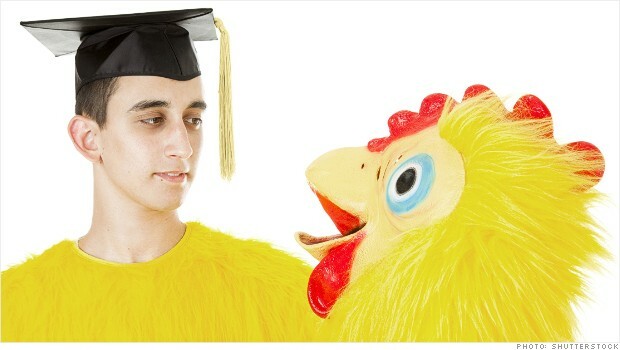 (CNN) - A survey out Tuesday found that 41% of college graduates from the last two years are stuck in jobs that don't require a degree. Consulting firm Accenture talked to 1,005 students who graduated from college in 2011 and 2012 and haven't returned to graduate school. In addition to those who are underemployed, 11% said they are unemployed, with 7% reporting they haven't had a job since graduating. The lack of job options in their chosen fields are weighing grads down, as nearly half of the recent graduates believe they would fare better in the job market if they'd pursued a different major. Nearly two-thirds of those surveyed said they would need additional training in order to start their chosen career, with 42% saying they expect to go to graduate school. That's a sharp change in thinking from those still in school: A separate survey by Accenture found that only 18% of the class of 2013 expects to need graduate school. It will likely be much higher, as job prospects are grim for the class of 2013. The unemployment rate remains stubbornly high at 7.6%, and recent graduates fare even worse, according to the Labor Department. 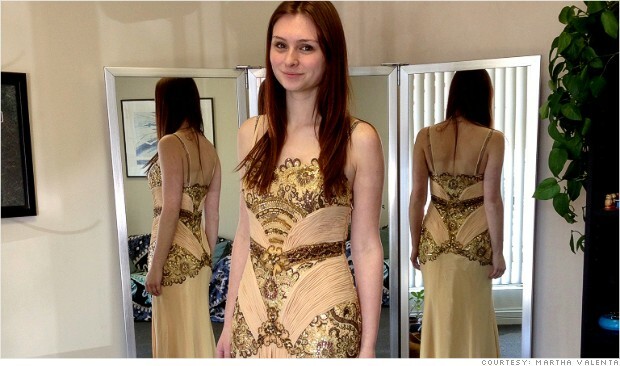 Sarah Hoffer, of St. Louis, spent $259 on her prom dress, which required an extra $220 in alterations. New York (CNNMoney) - From paying for a designer dress to renting a fancy limo, teens (and their parents) are shelling out hundreds or even thousands of dollars this prom season. On average, families expect to spend $1,139 on prom this year - up roughly 40% from 2011's $807 average and a slight increase from last year, according to a Visa survey. Families in the Northeast expect to pay the most, an average of $1,528, while Midwestern families were the most frugal, at an average of $722, according to the survey of more than 1,000 parents of prom-aged teens. With traditions like debutante balls falling out of fashion and young people getting married later in life, prom has grown in importance and people are willing to spend more on the big night, said Kit Yarrow, a consumer research psychologist. "Prom is the new wedding," Yarrow said. "I think that every society has to have a rite of passage into adulthood for young people, and prom has become that." The increase in prom spending is also being driven by the popularity of photo-oriented sites like Facebook and Instagram, she said. Prom is "a post-able moment" which has heightened the pressure around appearances. While parents still foot a majority of the bill, teens pay for about 41% of the costs, Visa's survey found. 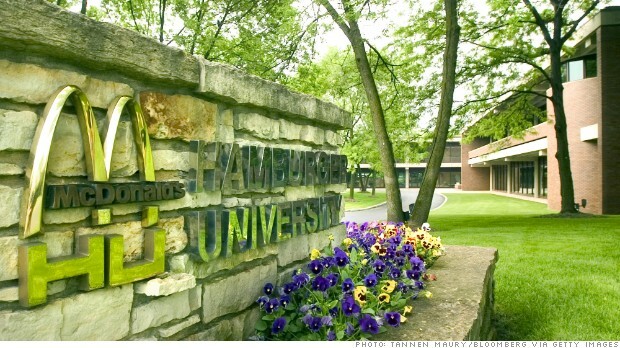 Every year, 5,000 McDonald's employees spend a week at Hamburger University at its Oak Brook, Illinois, headquarters. CNNMoney - Arianna Suarez's first job after emigrating from Cuba as a teenager was as a cashier at a Walmart in Hialeah, Florida, Thanks in part to college-level classes that Walmart offers online, she has risen through the ranks to store manager and is now on her way toward earning a college degree. From ethics to inventory management, the classes covered the skills Suarez needs to help run a round-the-clock, multi-million dollar retail operation with scores of employees. Even better, she has earned dozens of credits that she can put toward a bachelor's degree. A growing number of Fortune 500 companies, like Walmart, have grown tired of waiting for colleges and universities to produce the skilled workers they need and have started offering their own classes instead. And as an added bonus for employees: Many of these courses - from Starbucks' Barista Basics to Jiffy Lube's finance fundamentals - are eligible for college credit. "What companies like is just-in-time learning that gives somebody a skill they need at the time they need it," says Mark Allen, a Pepperdine University business professor and author of The Next Generation of Corporate Universities. "What traditional universities do to a large extent is just-in-case learning." In Seattle, Starbucks workers take courses called Barista Basics and Barista 101. They can earn one and a half credits from City University of Seattle for each of the company's two barista classes, and three credits apiece for higher-level management courses. 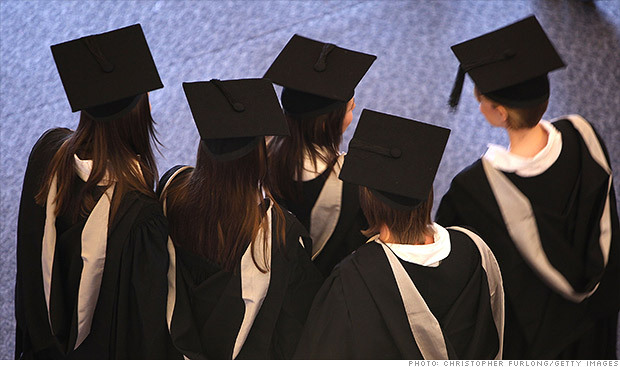 College grads under age 25 face an 8.8% unemployment rate, a new research report says. 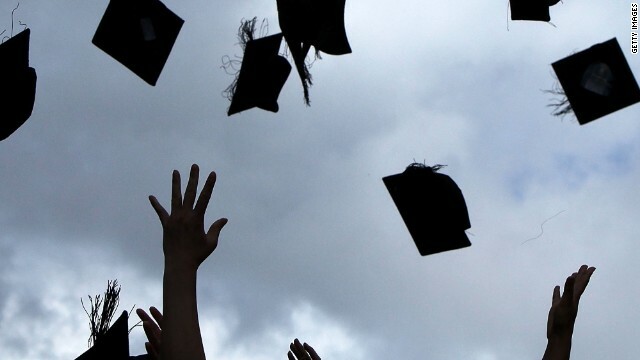 New York (CNNMoney) - The class of 2013 will face an "extremely difficult" job market when college students graduate in the months ahead, according to a new research report. Unemployment remains high for young college grads. For those who will find jobs, many will probably have to settle for low-level positions, the Economic Policy Institute said Wednesday. The unemployment rate for recent college grads between the ages of 21 to 24 has averaged 8.8% over the last year, according to Labor Department data. Once you also include young grads who are working part-time for economic reasons, and those who have stopped looking for a job in the last year, the so-called "underemployment rate" is a whopping 18.3%. Sure, the job market has improved during the past few years. But both these rates remain higher than pre-recession levels. New York (CNNMoney) - As tuition soars, parents and grandparents are putting more money than ever into 529 college savings plans. Average balances for 529 college savings and prepaid tuition plans grew to a record $17,174 in 2012 - up 12% from an average of $15,349 in 2011, according to a report from the College Savings Plans Network, a nonprofit and affiliate of the National Association of State Treasurers. Also known as "qualified tuition programs," 529 college savings plans are typically offered by the states and allow holders to save money and withdraw it tax-free, as long as the proceeds are used towards approved college costs - typically tuition, fees, room, board and other required supplies. Another kind of 529, prepaid tuition plans, let savers prepay for future tuition and lock in current prices, but they typically do not cover other expenses. New York (CNNMoney) - Tuition at public colleges and universities spiked to record levels last year, according to a new report. Average tuition costs - the amount students paid in tuition and fees after state and institutional aid was taken into account - rose by 8.3% to an average of $5,189 in the 2011-12 school year, the State Higher Education Executive Officers Association reported. In the previous academic year, students paid an average of $4,793. At the same time, state and local funding for operating expenses, research and student aid fell by 9% to $5,896, the lowest level in 25 years, said association president Paul Lingenfelter. 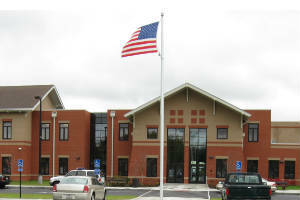 "State support hasn't been able to keep pace with enrollment growth," he said. Public enrollment has exploded in the past decade, increasing by more than 30%, Lingenfelter said. Today, public college students represent more than 70% of all post-secondary students. 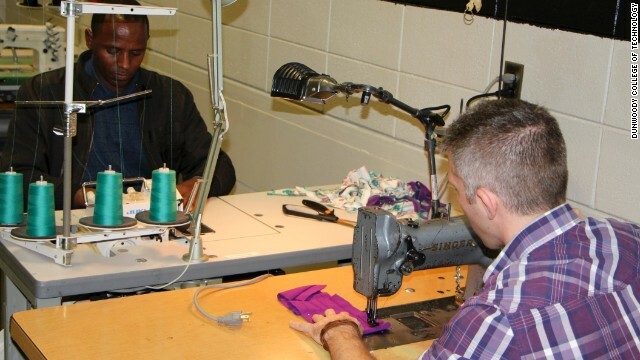 Students learn industrial cutting and sewing in a training program organized by a coalition of businesses and industry partners. Editor's note: CNN's Schools of Thought blog recently took a look at the high-tech return of high school shop class. (CNN) - By day, Scott Loeser works from home for a company based in Hong Kong, selling stationery and school supplies to American big-box retailers. "I want to be the guy selling stuff to Asian companies instead of selling for them," said Loeser, 35, whose background is product development, sales and retail branding. "I want to make a name for myself, but even if I have a product that's successful and great, how cool would it be if I could also say that I sew my own product?" To get closer to his dream, Loeser enrolled in a "sewing and production specialist" course at Dunwoody College of Technology in Minneapolis, where he'll learn the basics of sewing in an industrial setting and the production process. The program includes on-the-job training and a paid internship with a company in the Twin Cities region that could lead to a full-time job. Upon completion of the 22-week program, which began in January, he'll earn a certificate in industrial sewing through Dunwoody. It may not sound like the sexiest gig ever, but Loeser is one of 18 students who see the program as a ticket to a brighter future. Ranging in age from 18 to 64, their reasons for joining are as varied as their backgrounds. Some are lifelong Midwesterners, but nearly half are legal immigrants from as far as Somalia, Myanmar and Mexico. Some of them want to make use of a skill they utilized in their homeland or find a steady job that keeps them off their feet; others, such as Loeser, see a path to entrepreneurialism. That the class exists is a testament to the growing demand for a trade considered nearly obsolete in the last decades of the 20th century. The last time Dunwoody offered a cutting and sewing class was in the 1940s before it was dropped because of a lack of industry demand, said Debra Kerrigan, dean of workforce training and continuing education. Fast forward six decades and the demand for a skilled cut and sew industry has returned to Minnesota, home to about 8,000 manufacturing companies, many in desperate need of a workforce trained in trades lost in an era of outsourcing and automation. New research shows that an associate's degree can lead to a higher wage than a bachelor's degree. New York (CNNMoney) - Berevan Omer graduated on a Friday in February with an associate's degree from Nashville State Community College and started work the following Monday as a computer-networking engineer at a local television station, making about $50,000 a year. That's 15% higher than the average starting salary for graduates - not only from community colleges, but for bachelor's degree holders from four-year universities. READ: Which colleges provides best bang for your buck? The average wage for graduates of community colleges in Tennessee, for instance, is $38,948 - more than $1,300 higher than the average salaries for graduates of the state's four-year institutions.